Flexible polyurethane foam is another material commonly used in protective packaging applications. Polyurethane foams are characterized by an open cell construction and have a softer feel, especially in the lower density and firmness ranges. They are most often the material of choice for smaller, lighter, and more shock-sensitive products. Flexible polyurethanes are produced in large buns, resulting in almost unlimited dimensional flexibility. They can be fabricated in numerous ways, including sawing and die-cutting. Unlike polyethylene foams, however, polyurethane foams cannot be welded; joints must be glued. Flexible polyurethane foams are produced in a wide range of densities and firmnesses. Foam density is expressed as the weight per cubic foot of material. Firmness is expressed numerically as IFD (indentation force deflection), and is completely independent of density. 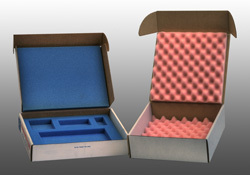 The physical properties of polyurethane foam make it an excellent choice for convoluting – a common protective packaging configuration.